Bruce Coville is the author of nearly ninety books for young readers, including the international best-seller My Teacher Is an Alien. He has been a teacher, a toy maker, a cookware salesman, and a grave digger. In addition to his work as an author, Bruce is much in demand as a speaker and as a storyteller. Join Bruce as he reads from Always October (HarperCollins, $16.99) & Amber Brown Is Tickled Pink (Putnam, $14.99). 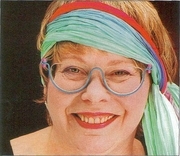 Paula Danziger is currently considered a "single author." If one or more works are by a distinct, homonymous authors, go ahead and split the author. Paula Danziger is composed of 5 names. You can examine and separate out names.